Review Information Last Updated on: 26th October, 2016. 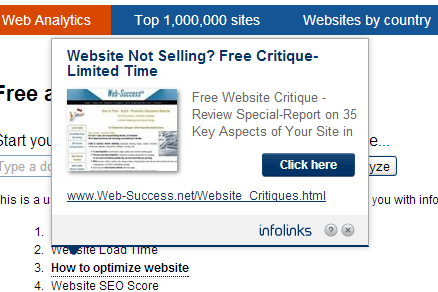 Update: MonetizePros readers now get a 10% earnings boost at Infolinks, click here to sign up! Infolinks ads are not traditional diplay ads that other networks such as Google AdSense might serve. Rather, the intent of Infolinks ads is to combat the end-user’s banner blindness by introducing less prevalent ad units that are better integrated into the website’s content. Infolinks’ inFrame, inSearch, inTag, and inText units are designed to do just that. Overall Rating: 4 out of 5. What We Like: Quick and easy implementation, placements are less susceptible to banner blindness. What We Don’t Like: Implementation may look spammy, ad relevancy can be an issue for some industries. Publisher Language Requirement: There are no language requirements stated in the Publisher Service Agreement. Advertising Types: Display, In-Line Text. Infolinks Tech Implementation Rating: 3 out of 5. Creating an Ad Unit: Creating an ad unit is incredibly simple. Infolinks boasts that it takes one minute to implement their technology, and to their credit, that is no exaggeration. Simply copy one snippet of HTML code, paste it into the end of your HTML source code, and Infolinks starts serving ads on that webpage immediately. The default “1-Minute Integration” is Infolinks’ inText product, but other more traditional looking ad units are also available. To activate inFrame, inSearch, or inTag units, go to the “Customize” section of the control panel, and from there you can activate each type of unit that you want implemented on your website, without needing to add any additional code. Unfortunately, ad relevancy is usually very poor. Display Ad Unit Sizes Available: N/A. Compatible with Google AdSense: Yes, as long as ad units are not styled to look like AdSense units. Infolinks Publisher Reporting & Admin Control Panel Rating: 4 out of 5. Control Panel: The Infolinks control panel is user friendly and easy to navigate. The top navigation has links to “Reports”, “Integrate” (where you get the HTML code), “Customize” (where you can activate and deactivate certain types of ad units as well as customize the look and feel of them), “Account”, and “New”. There’s also a link on the left sidebar to “Add New Website” in case you have more than one website you want to put Infolinks ads on. One of the great things about Infolinks is that everything is controlled from the control panel. You drop the HTML code on your site once, and then any change you ever need to make to the ad units is done from within the control panel. For anyone who is uncomfortable editing a large amount of HTML code anytime any change needs to occur, the Infolinks control panel is a great solution. Reporting: The reporting section within the Infolinks control panel is simple to use, with the default display showing data for the trailing 7 days. Unfortunately, the simplicity of the report leaves a lot to be desired. 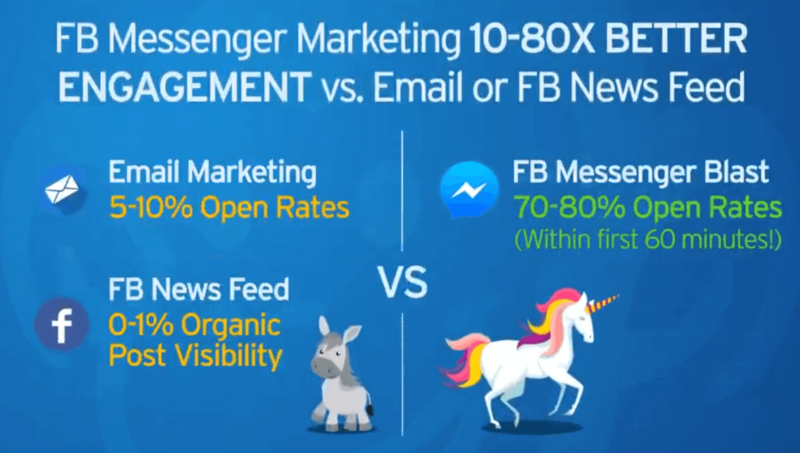 Besides daily net page views, ad views, eCPM, and earnings, there is no further breakdown, no ability to get more granular data. It would be nice, for instance, to see which pages were performing well, and which ad units specifically were outperforming or underperforming. 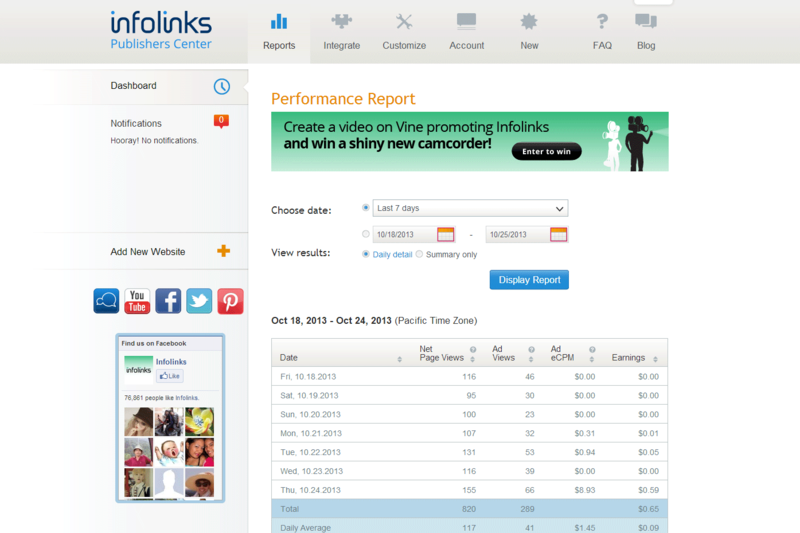 For a power user who wants to dive in to an in-depth report, the Infolinks reporting is going to leave you disappointed. But it is the simplicity of the implementation that may be to blame here. More complex reporting would likely make implementation a little trickier, so that is the trade-off. Infolinks Payment Rating: 4 out of 5. Publisher’s Share of Revenue: 70%. Payment Methods Available: PayPal, wire, eCheck, Western Union, ACH, Payoneer. Infolinks Account Help Rating: 4 out of 5. Infolinks offers an interesting and relatively unique alternative to traditional display advertising. Probably the best aspect of Infolinks is the ease of implementation. The major downside however is low ad relevancy and therefore low revenues. Infolinks has four different types of ad units from which publishers can choose to implement on their websites: inText, inFrame, inSearch, and inTag. The inText ad unit is the default unit that is activated upon first completing account setup at Infolinks. 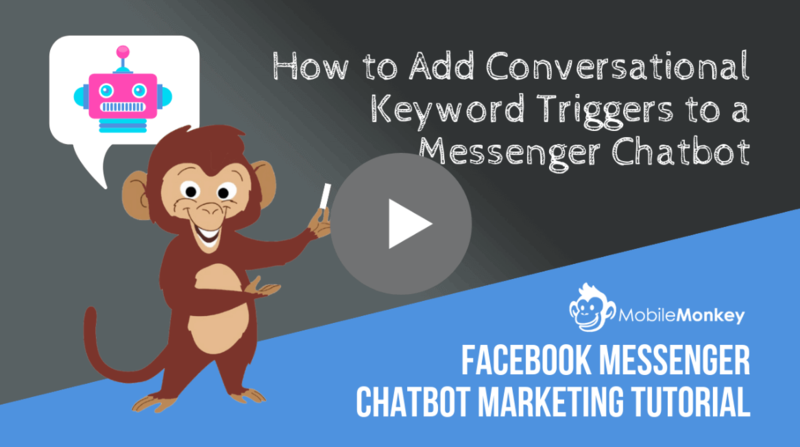 The inText ads highlight words already on the webpage and monetize them with ad units that display when the highlighted word is hovered over with the cursor. The highlighting is generally a double underline, so as to distinguish it from the usual single underline treatment that regular hyperlinks have. The upside to the inText ad unit is that it is hard not to notice; that is to say banner blindness is not a problem with these types of ads. If your user reads the text on your page, he is definitely going to notice the highlighted words on the page. The problem is that all too often there is a disconnect between the highlighted words and the actual ad that is displayed upon hovering over. The inFrame ads are standard display ads that are generated to automatically slide out from the left and right sides of the browser window soon after the webpage load has completed. They are in the form of wide skyscrapers and can be either a series of text ads or a single image-based banner ad. The on-site implementation looks pretty slick. But like all of the other Infolinks units, relevancy is a major problem. The inSearch ads display for visitors arriving on your site via a search engine. Shortly after the page loads, a small ad unit will slide up from the bottom of the browser window, with the text, “Searching for [keyword]?” The concept of the inSearch is a good one. Unfortunately, the execution is lacking. Often times, the keyword in the ad unit does not match the searched-for term; therefore, the ad is not relevant to the user. Otherwise, the ad is fairly unobtrusive and should not show for your most loyal visitors. The inTag ads function a lot like Google AdSense’s link units. They appear as keywords (usually 4-5 in a single line or 8-10 on two lines) that when clicked take the user directly to the advertiser’s landing page, or when hovered over offer additional information on the advertiser’s product. Much like the other Infolinks units, relevancy can be an issue. On our example page (the article about WordPress resources), the inTag unit’s links were for “Get a loan”, “Debt Help”, “Restaurant Menu”, “Security Systems”, and “Make real money”. Those topics are far from relevant and therefore the click rate and revenues are going to be abysmal. Not only are the inTag unit’s topics not relevant, but there is a disconnect between some of the topics and the resulting advertiser. For instance, hovering over “Get a loan” displays an ad for brokerage firm Scottrade, which does not in fact offer loans, but rather the ability to buy and sell stocks. As far as reporting is concerned, the publisher control panel makes pulling up basic reporting a very simple task. But as mentioned above, the reports lack the punch that power users desire. The trade-off to the simplicity of tech implementation is that complex reporting (by unit or by page, for instance) is not possible. Reporting by date is available, but that’s it. For most users, this is not a major issue. But for those of us who wish to delve deeper into the data to further optimize our sites by pulling bad units and further pushing or tweaking stronger performing units, it’s impossible to glean from the reports exactly the data we are looking for. Payment terms at Infolinks are quite favorable. A 70% revenue share is one of the best in the business, even ahead of the 68% that Google AdSense publishers take home for display ads. Plenty of payment options are available, including PayPal, wire, eCheck, Western Union, ACH, and Payoneer. And a Net-45 payout is reasonable. The only question is whether or not you’ll ever reach the $50 minimum payout to actually receive payment. In testing Infolinks on our site in the technology vertical, we were able to achieve a $0.66 RPM, meaning we would need to generate 76,000 pageviews just to reach the minimum payout of $50. If your site is generating hundreds of thousands of pageviews a month, this should not be an issue. But if your site generates fewer than 10,000 pageviews a month, just be aware that you may go several pay periods without receiving a check from Infolinks. Overall, Infolinks is a great idea that simply lacks execution. It may be a lack of quality advertisers, a lack of good technology, or both. Whatever the case, ad relevancy and therefore revenues are certainly not one of Infolinks’ strengths. That said, if you are seeking an alternative to traditional display advertising, they should be considered. Signup and tech implementation is so easy, that testing (even if only for a few days) is worthwhile so you may decide for yourself whether it works for your site. Join Infolinks by clicking here.